There are a lot of companies out there trying to cash in on the success that Square Register has found, but it is getting a little late in the game for add-on programs to utilize Square as their payment gateway and offer additional features. However, Vend has designed its own mobile cash register solution to try to compete in this arena, and they have a few things to offer that no one else can. Rather than being a cut-and-dry cash register platform that allows you to swipe credit cards through the headphone jack, Vend’s solution allows a fully customizable experience through a series of add-ons to make your POS systems work for your needs. Here are some of the stand-out details of the Vend point of sale system. Much like Square Register, Vend’s aim is to offer a mobile cash register that provides sales tracking, inventory controls, customer loyalty programs, and the ability to accept credit cards. Unlike any other POS provider, they try to offer a modular system that allows you to adapt the software for any business model. While the simple and pure design of Square Register is perfect for the vast majority of businesses, Vend is trying to fill in the gaps with a set of options that can allow you to customize the checkout process and inventory management system to fit your exact needs. Much like the other digital cash registers you’ve likely experimented with, Vend is powered by a very basic core system that functions as a touchscreen point of sale system. There’s not much new to see here, just the standard “push-button” style ringing of your pre-programmed products that are grouped into categories. The real magic that Vend offers is their add-on options that allow you to customize your cash register experience. There are a number of great add-ons that allow you do manage your store more efficiently. The add-on called Swarm allows you to track things like your store’s foot traffic, conversion rates, and more. You can also setup your POS to accept other payment types such as PayPal, Authorize.net, and a variety of other platforms. With more software add-ons to come, it is easy to see that Vend is trying to be the most versatile option out there for a mobile point of sale system alternative to big companies like Square and Shopify. 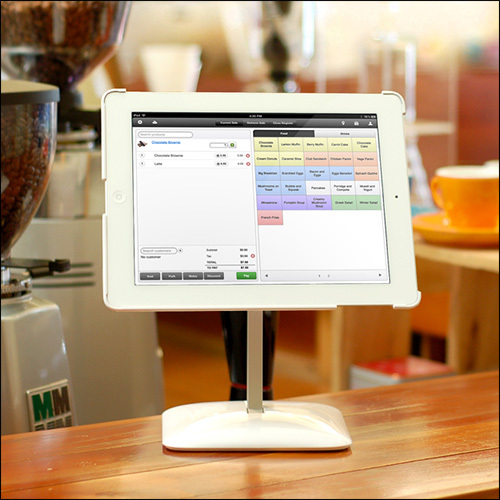 Most of the mobile POS system options out there are powered by either an iPad or another brand of tablet PC. While you can certainly use those to run Vend, you can optionally choose to use a laptop for a more powerful experience. Vend also works with a variety of printers, cash drawers, and other hardware, and the compatibility of each is listed below. You will also need a network router that has both wired and wireless connection options for everything to work properly. Since you’re probably going to use an iPad, the Apple Airport router is an obvious choice; but you can use any brand. Once you setup your hardware to work with your chosen software options, your mobile point of sale system will be ready to roll.